DON'T FORGET to configure your git environment. The 'commit' record must contain either your Eclipse User ID, or the email address registered with the Eclipse Foundation. Note that the above will set this as the default user name and email address to use when writing commits. You can set user.name and password on a per repository basis. This will set the username and email address on just the current git repository. When looking at the repositories, those using the Gerrit Code Review tool are identified as such. Please see Gerrit for more on Gerrit Code Review. Your correct Git committer_id identity is at eclipse.org can be found on the Gerrit settings page. Your user ID is the same for SSH Git and Gerrit. Note that it is NOT the same as your wiki.eclipse.org Username (which is essentially your email address), or bugs.eclipse.org Email Address. Your Git password is your Eclipse.org site account password as set on https://dev.eclipse.org/site_login/myaccount.php. Gerrit maintains its own password for https: https://git.eclipse.org/r/#/settings/http-password. Gerrit also maintains its own SSH keys: https://git.eclipse.org/r/#/settings/ssh-keys These passwords and keys are only used for Gerrit and are not interchangeable with the eclipse.org credentials. Gerrit over SSH does not permit password authentication. A public key must be uploaded for Gerrit over SSH. If your firewall blocks SSH (port 22) and Gerrit SSH (29418) please try the https:// URLs provided by Gerrit. Please see the list of Git repositories (above). These services are provided via Gerrit. Before committing code to your cloned repo, please ensure that your Git environment is properly set. 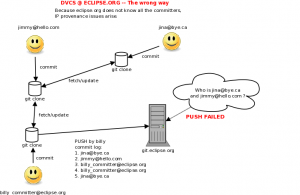 Otherwise, the user ID and/or email address stored in the commit transaction in your repository will not match your committer ID and/or email address of your Eclipse Committer record with the Eclipse Foundation, and your push will fail. Due to our rigorous IP process, the Eclipse.org use-case for a DVCS is different than that of other Open Source organizations. For this reason, an update hook is installed and must remain in place on every Git repository to ensure a clean IP provenance. Jane Contributor is Author of code. Commits to her local repo. Jane Contributer pushes (publishes) to a committer's local repo. Committer pushes code to git.eclipse.org will fail. Committer cannot push code to us from a non-committer. is Author of code. Commits to her local repo as jane@someisp.com. Jane Committer pushes code to git.eclipse.org will fail. Eclipse.org does not recognize jane@someisp.com. Jane Committer, on project B, is Author of code for Project A. Commits to her local repo. Jane Committer pushes (publishes) to a committer A's local repo. Committer A pushes code to git.eclipse.org will fail. Committer A cannot push code from a committer who is not on their project. Joe Contributor Authors code. Commits to his local repo. Joe Contributor attaches patch to Bugzilla. Committer applies patch to his local repo, commits to his local repo. Committer pushes code to git.eclipse.org will succeed. Committer can push their committed code to us, preserving the Author information in the transaction. Project Team A has 5 committers. All committers commit to local repo. Committer can push their committed code, as well as commits performed by other project members. Please see Handling Git Contributions for information on how to handle "pull" requests from non-committers. Please file a bug(community -> git) if your project needs a new repository created. The cGit web view at http://git.eclipse.org/c/ supports rendering a Markdown, HTML or plaintext file in the root of the repository, in the master branch, as the "About" tab. In the root of the repository, the file names below are searched (in the order listed). Note: case is important. Such as a file name of "README.MD" will not trigger the "About" tab to be displayed, even though though the <url>/about/ will still display the markup. If you are required to permanently remove code from a Git repository, please open a bug against Community/Git and Webmaster will do this for you. Please login to Gerrit(https://git.eclipse.org/r) to manage your public keys for ssh access. As mentioned in bug 329841 you can use the cGit web interface to get code, if you just need the code, and do not need to clone the repository, say to prepare patches or commit changes back in to the main repository. If you want to add code review to your Git tool box then see Gerrit. If the ssh commit works, and the permissions are not ok then either file a bug, or send a note to Webmaster asking to have the default mask on your git repo repaired. See bug 363599 for details. The following resources are recommended reading for anyone new to Git or patch-based distributed version control systems in general. Feel free to add links here to reading that you found to be useful. msysgit - A git client and bash shell for windows - might need some crlf flags set, not sure. Subversion Re-education - A guide to the conceptual differences between revision based systems like Subversion/CVS and patch-based systems like Git/Mercurial. Provide a description for your Git repository by editing the description file in the repository root. This description is used in a couple of different places to help the community understand the purpose of the repository. Keep the description concise (e.g. one line of prose). Provide a CONTRIBUTING file in the root of your Git repository. GitHub, for example, encourages this convention to help members of the community understand how to contribute to the project. Please see Handling Git Contributions for further information. This page was last modified 10:32, 23 August 2017 by Bob Walker. Based on work by Eclipse Webmaster, Elliotte Rusty Harold and Dani Megert and others.